Saturn's Moon Titan has long intrigued astrobiologists. Both Rovers Working on Rocks. NASA's Spirit rover used its rock abrasion tool to dust off a rock called "Humphrey", and then backed away to see the whole rock with its thermal emission spectrometer - this should tell it what minerals are present in the rock. Once it completes this task, the rover will actually grind a hole to see under the rock's surface. Opportunity is also examining rocks on the other side of Mars, and it's getting ready to exit the crater that it landed in to search for evidence of past water on the plains. Simulating Titan's Atmosphere in the Lab. 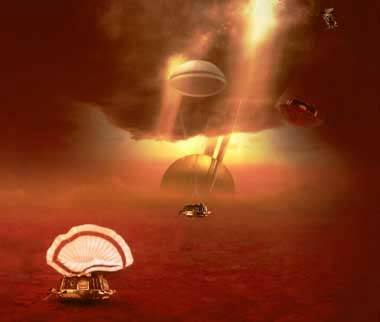 Saturn's Moon Titan has long intrigued astrobiologists as a possible environment that was similar to our own Earth's early history. Its atmosphere has the same pressure as Earth, and it could contain chemicals called tholins - a building block for life. The Huygens probe, currently piggybacking a ride on NASA's Cassini spacecraft, will measure the atmosphere when it arrives later this year, but researchers are working to simulate Titan's complex Chemistry in a laboratory environment right here on Earth. New Insights Into Martian Atmosphere. Astronomers have found Hydrogen peroxide in Mars' atmosphere. The team gathered the data when Mars made its closest approach to Earth in the summer of 2003, using the 15-metre James Clerk Maxwell telescope (JCMT) in Hawaii. Hydrogen peroxide is used as an antiseptic to kill bacteria on Earth, so it could help sterilize the surface of Mars. Many astrobiologists now think that the best chance of finding bacteria on Mars will be underneath the surface, which would be protected from this Hydrogen peroxide and ultraviolet radiation from the Sun. Mysterious X-Ray Sources Could Be Black Holes. So far, there are two known types of black holes: stellar, with the mass of 10 suns, and supermassive, which can be billions of times the mass of our sun. Astronomers think they might have found a new classification of black holes, with the mass of hundreds of suns. What's unusual about these objects is that they're not as hot as the larger or smaller black holes, but the cloud of gas around them is dozens of times larger than a stellar black hole. Mars Express' Image of Hecates Tholus. The European Space Agency's Mars Express spacecraft took this image of the caldera of Volcano Hecates Tholus; it's 5300 metres tall, and the northernmost of the Elysium Volcano group. The photo was taken during orbit 32, when the spacecraft was 275 km above the volcano. Astronomers from the European Southern Observatory (ESO) have shattered the record for finding the most distant Galaxy ever seen. By using a gravitational lens to magnify more distant objects, the team has found a Galaxy which is 13.2 billion light-years away; the Galaxy is being seen when the universe was only 470 million years old. The young object is 10 times less massive than our own Milky Way, and looks like it was a building block for present day galaxies.